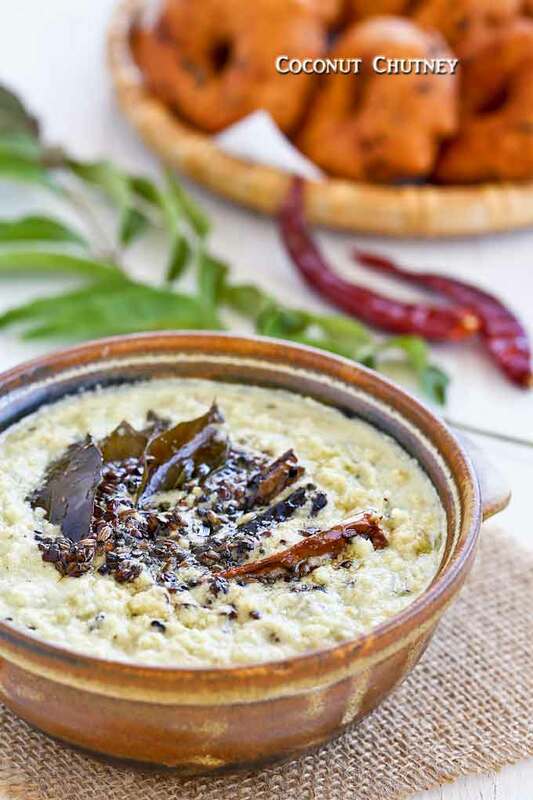 Coconut Chutney – a South Indian condiment made of coconut, chili peppers, and spices. A must-have with idli, thosai, and vadai. Very tasty! 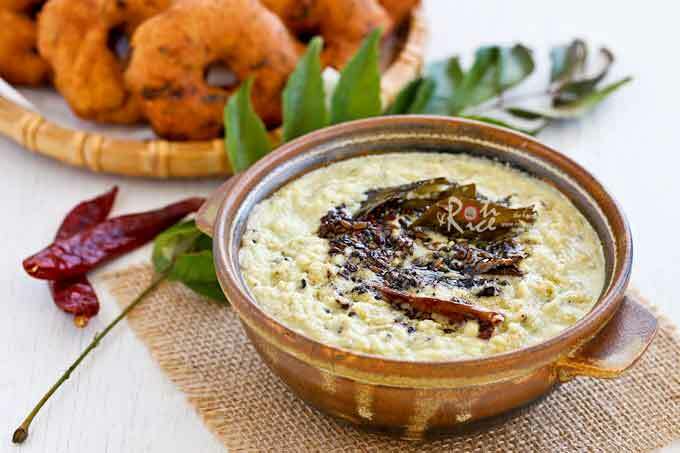 If you enjoy Indian food, you have probably tasted Coconut Chutney. It is a spiced coconut dip usually served with idli (steamed lentil cake), thosai (lentil crepe), or Ulundhu Vadai (lentil donut). This condiment may not stand out on its own but provides great flavor when eaten with the aforementioned side dishes. 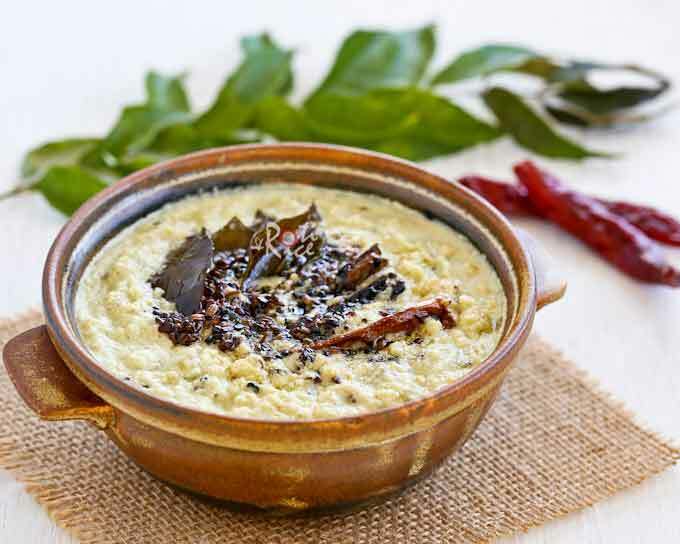 Compared to other South Indian condiments, Coconut Chutney is relatively mild. The main ingredient is fresh coconut, usually blended or crushed into a paste together with some roasted chana dhal (lentils). Then fried chili peppers and spices are added to give it heat and flavor. Sometimes, a little tamarind juice is added to make it slightly tangy. Most recipes for Coconut Chutney calls for asafeotida or hing. It has a fetid smell (almost sulfurous) and typically works as a flavor enhancer. Out of curiosity, I bought a small jar and used a pinch of it in the recipe below. I kept it for a while but the odor was so strong (even though I double-bagged it), I had to throw it away. I have to say though that when used in small quantity and heated during the tempering, the odor and flavor is much less pungent. You can omit it if preferred. Back in Malaysia, Coconut Chutney is commonly found at the Indian restaurants. I especially enjoy eating it with those amazing cone shaped paper thosai and Medu or Ulundhu Vadai. I took it for granted and never thought I will miss it until I moved here. Thankfully, I can find the ingredients at the Indian grocery store not far from where I currently live. The recipe below was adapted from this recipe which is quite similar to the ones I have tasted in Malaysia. Coconut Chutney - a South Indian condiment made of coconut, chili peppers, and spices. A must-have with idli, thosai, and vadai. Very tasty! Dry fry chana dhal in a small pan for 3 to 4 minutes. Combine cooked chana dhal, grated coconut, jalapeno pepper, ginger, salt, and water in a blender. Blend until smooth. Transfer to a bowl. Heat vegetable oil in a small saucepan. Add dried chilies, curry leaves, urad dhal, mustard seeds, and cumin seeds followed by the asafeotida. 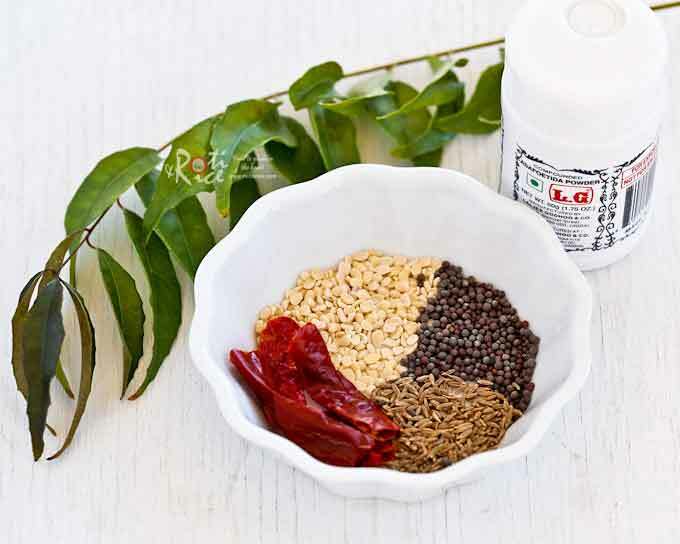 Turn off stove when dried chilies and curry leaves turn crisp and mustard seeds start to pop. Immediately pour tempered mixture over the coconut mixture. Stir with a spoon to combine. Serve with desired flat breads or vadai. Coconut Chutney is best consumed within the day it is prepared. Always freeze (not refrigerate) leftovers. Do give it a try.